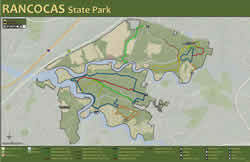 Rancocas State Park can be reached by I-295, exit 45A or via Route 38 into Mount Holly. Proceeding onto the Mount Holly bypass, make a left at the second traffic light. Follow signs to the park for about 4 miles. NOTE: Picnic facilities and restrooms are NOT available in this park. The Rancocas Creek provides an idyllic setting to observe nature up close in this rustic park. Hikers, bicyclists and joggers are welcome, however, there are no staffed facilities on site. The Rancocas Nature Center (entrance off Rancocas Road) hosts a variety of wildlife and outdoor programs. Through the Carry-In/Carry-Out Program you can help us keep your parks clean and beautiful by carrying out the trash you carry in. Thank you for your cooperation and remember to recycle. Should you require immediate, medical emergency assistance please call 911. To report all other law enforcement emergencies, please call the NJDEP Trenton Dispatch at 1-877-WARNDEP [1-877-927-6337]. Rancocas State Park is patrolled by the State Park Police. The Rancocas Nature Center has nature trails, guided walks and summer camps. For more information, please call (609) 261-2495 or visit them on the web at www.rancocasnaturecenter.org. The Nature Center is a unique partnership involving the NJ Department of Environmental Protection, Division of Parks & Forestry, the Burlington County Board of Chosen Freeholders, Westampton Township, the Rancocas Conservancy and the Friends of the Nature Center at Rancocas State Park. Rancocas State Park is located within Deer Management Zone #48. Portions of the property are open to properly licensed bowhunters during Fall, Special Permit, and Winter seasons in pursuit of whitetail deer. No other game species may be taken. The property has several leased tenants, including farmers and model airplane enthusiasts. Hunters are reminded to respect official "Safety Zones" and posted areas that are identified as "No Hunting" or "No Trespassing". Violators will be prosecuted.